Thank you so much to all those supporters, with other villagers, who turned out yesterday to participate in the Great Hayfield Litter Clean Up. 'Great' it was! The sun shone and over 70 people turned out to do their bit (up 40% on last year! ), collecting around 80 full bin bags of rubbish, of which we were able to segregate about 15 bags' full, to go for recycling. This is a great achievement, and says much about how we/you care about the village we live in. We got a barbecue set, chairs, a road-sweepers' broom, a hand-crafted 2 foot high snowman, several balls, scaffolding poles, crates, garden netting, and bottles and cans a plenty (roll on the refundable deposit scheme), together with hub cabs, wing mirrors, and bumpers from the A624. A right royal haul! So............thank you to all who joined in, gave up some of their time, and showed what we can do when we all pull together! The weather forecast for Saturday looks set fair (no snow! 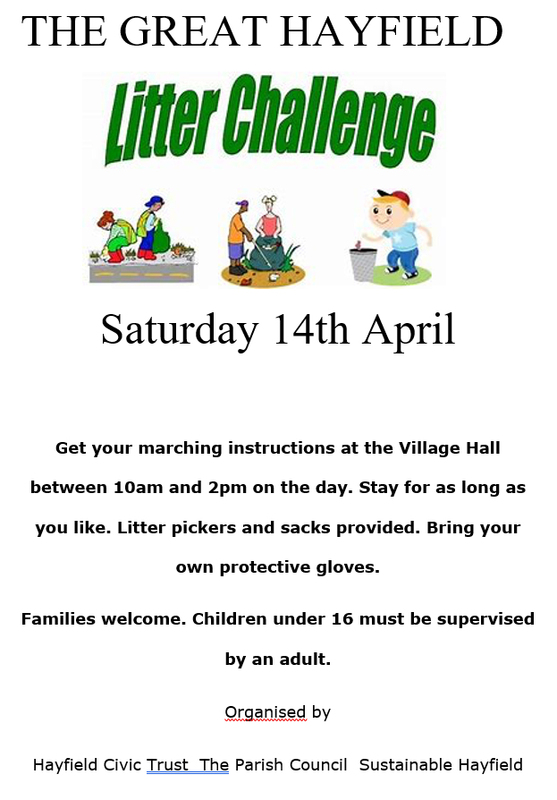 ), so we should be all action stations for the Great Hayfield Litter Challenge (10-2.00p.m. ), organised by the Civic Trust, Parish Council and ourselves. We hope, as someone who's indicated interest/commitment in us living less wasteful lives, that you'll be able to give an hour or more of your time Saturday to help Hayfield look its best and rid ourselves of some 'grot spots'. Report in at the village hall with your protective gloves (and wellies if you're interested in tackling the river) and get your 'territory' for attention. Help-yourself refreshments are available at the village hall. Last year around 50 people turned out: it would be great a similar number again!